Ledden Palimeno's business revolves around winning customers at one high profile trade show. You can't beat word of mouth advertising for building credibility. 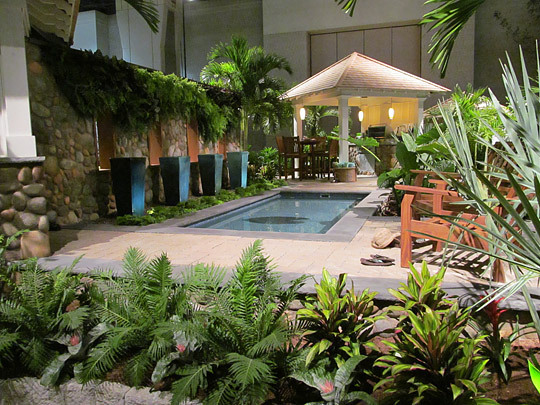 Contractor Joe Palimeno greatly accelerates word of mouth by building an annual exhibit at the Philadelphia Flower Show. The show is so big and his exhibits are so high profile and effective, he estimates about 30% of his annual sales come from the show. The show accounts for 90% of his annual advertising budget. 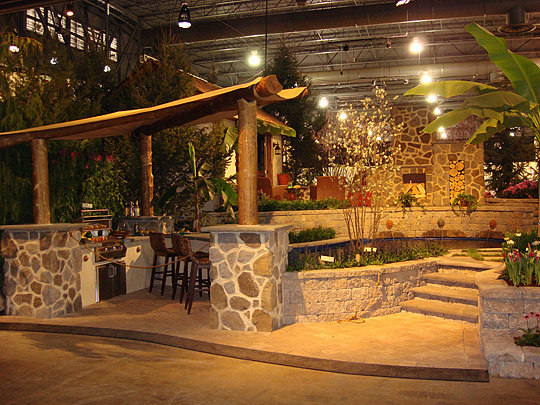 With 275,000 attendees, the Philadelphia Flower Show is the world's largest indoor flower show, and this year Joe's exhibit for the EP Henry company won the Best in Show award. He says, "It means a lot because in this area everybody knows about the Philadelphia Flower Show. The show has really built some credibility for me that's hard to get." As a huge visual event the show receives coverage on all area TV stations. Joe estimates that in 10 years of building exhibits, he's received coverage in 50 newspaper articles. This year he received front page coverage for his award in the local newspaper. Joe's won other awards at the show in the past, but says he's mostly in it to win customers. He says for a display to be truly effective, it must be transferable. "We want people to walk up to the exhibit, and say, 'Wow, I could do that in my own yard.'" "The idea is to get people to visualize themselves in it. That is the key. So we accessorize a barbeque area with food. There's a newspaper out there, and there are glasses of lemonade to make it look like the area's being used." To take this a step further, Joe says EP Henry wants people in the exhibit, not just walking by. This year people entered the exhibit through 2 sets of French doors. "It was like they were walking into a sunken garden with 30-foot Birch trees, 25-foot Douglas fir – all surrounded with 6-foot high retaining walls of their product. It was like you were inside somebody's backyard. When we do a good job of that, we write up a lot of business off of the show because people will see what we can do for them." While Joe's had many good years at the show, he's had some exhibits that just didn't get much attention. "We basically took the client's idea and created an exhibit, but it just didn't express what we did." Joe was excited when he was first invited to work with EP Henry 3 years ago. 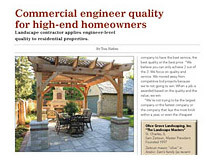 EP Henry is very respected as a successful company and one of the biggest employers and paver manufacturers in the area. Being selected by them gave Ledden Palimeno instant credibility. Joe says EP Henry didn't want to build a static product display of blocks and pavers. 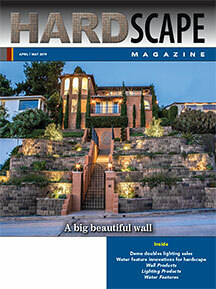 Joe explains, "The exhibit I put in for them was probably 60% greenscape, and only 40% hardscape. 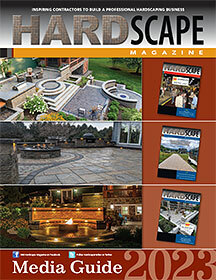 But – it's also very evident that that garden couldn't be created without their product." Joe says a trade show like the Flower Show makes his work look better than showing off normal jobs. "You're given a chance to work in such a grand scale there. And the garden's going to be mature and in full bloom. It's not going to be your typical landscape where you plant 18- to 24-inch shrubs that are going to take 3 years to mature. There may well be snow outside the early March Philadelphia Flower Show. But inside at the EP Henry booth, all trees, annuals and perennials will be lush green. And flowers that naturally bloom at different times of the year will all be in full bloom now to create an exhibit more spectacular than nature can produce. While the show only lasts a week in March, planning must start the prior August to get everything done to make the exhibit happen. By the end of September they've got a master plan in place, and all trees and perennials are already tagged. Joe says, "We hand select them because they have to be the best of the best." By November, Joe says all the perennials have to be cut down so there's not much more than a root in the soil left. Plants are then forced into dormancy by placing them in dark 45-foot refrigerated trailer bodies which Joe rents. Beyond serving as a marketing tool, the show keeps Ledden Palimeno employees busy with winter work. "All winter we're building exhibits for the show. This winter we built a complete façade of a house in our garage. We had to take it back apart, prefabricate it and reassemble it at the show. We built a pergola. We built most of that exhibit." About December 1, depending on each plant's bloom cycle, they start pulling plants out of the cooler and placing them in the 4 or so greenhouses they also rent. Joe says, "We count everything back from the day we need it to bloom. If the show opens on March 1 and that's the day of judging, everything has to be perfect that day." Plants that bloom too soon go back in a 40-degree cooler. They "force plants" with both heat and light to replicate the warmer/longer days of spring. Over the course of several weeks they give the plants more and more light and bring the temperature up 70-degrees. The plants are hauled to the show floor in 45-foot heated tractor trailers. Joe says they may only haul 3 of the larger trees per trailer. "This year we had 30-foot clump river birch trees. This is a plant that's in full leaf. We're not going to tie this plant up and possibly damage it. Same thing with the 25-foot flowering cherry trees we put in. Half the flowers fall off even if you just take that trunk and shake it. So we have to be as careful as possible. They time flowering trees so the flowers are just starting to open at the start of the show and will remain in bloom the whole show. Joe says they've developed their timing plan by taking good notes each year on what has worked. But there's always some trial and error as they work in new plants. With such an awesome exhibit, Joe works to make the most out of it. He buys maybe 100 tickets and mails them to prospects and existing clients as well as to architects and engineers he works with. He sends along a little note telling about this year's exhibit, and inviting them to stop by. He develops an "about-the-builder" flier that EP Henry staff graciously hand out with their EP Henry catalog at the booth. While he often stops in at the booth to answer questions and talk to people, Joe spends most of show week showing clients and prospects around. "I can get them in at 7am (show doesn't start until 9am) to beat the crowds. I'll get the husband and wife together, and we have a great time. A lot of times they've never been to the show. And, they say 'wow' you created this. They put their hands on it and touch it. And they say that's what I want in my yard. Then maybe take them to breakfast, or lunch." Once people see the exhibit and spend quality time with the contractor who built it, hiring that contractor becomes very easy. Joe Palimeno hired Charles Vander Kooi to evaluate his business in 1996. Joe credits Charles with helping him see where he was making money and where he wasn't. 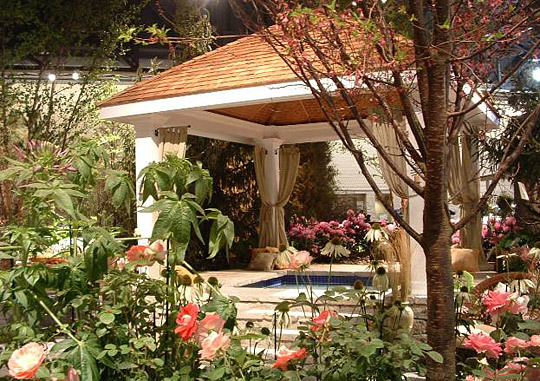 This convinced Joe that he needed to focus on high-end design/build work like that he does at the Philadelphia Flower Show. While Joe continues to actively work in his contracting business, he was such a good student of Vander Kooi principles that he became a consultant in 1998, and now helps other contractors manage their business. Joe was also a very good student of the EP Henry company. He knows a vendor wants to see their products in action, so many times in the past he's taken EP Henry representatives (including the company CEO) out to see how their products were being used. 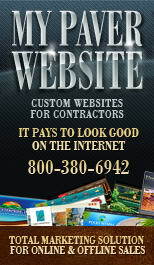 His company is also an EP Henry authorized contractor with several ICPI certified employees. So EP Henry feels very comfortable forwarding him leads from showroom visitors, and they felt very comfortable hiring him to do their trade show exhibit.